Relax from the word "go"
Whatever your circumstance, we have a service to suit you. Moving house? Whether you’re juggling time, boxes or excitable children, Robinsons provide tailored support to make your move effortless. Working in removals since 1895 has taught us this: one size doesn’t fit all. So, we tailor our services to your individual needs. For over 120 years, we’ve helped people like you up sticks, and then seamlessly settle back down again. There’s no hassle in-between the two stages – we make sure of that. As one of the largest removal companies in the UK, we understand that taking care of small details makes your move easier. Each move we undertake is managed by a dedicated Robinsons Move Manager. Our Move Managers are fully-trained professionals who understand just how chaotic moving house can be. They are your point of contact before, during, and after the move. Why not try us on for size? For a free, no obligation home-moving survey and quotation, fill in your details above. One of our local Moving Consultants will visit you for an informal chat about your upcoming move. If you’d like more information, don’t hesitate to speak to us directly. Please call us, free, on 0808 302 6750. We’d love to know more about you and your move. Our branches cover most of the UK. Take care of all move paperwork, including parking requirements. We know moving is stressful, that’s why we out you first. We make the move fit you to take the stress away. Our customers love us – see what they say! We price competitively, but never compromise our quality of service. 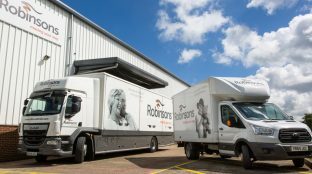 Robinsons have been moving families and businesses since 1895. Call today to arrange your home survey. With 120 years experience, we know it’s not just a matter of moving things from A to B. It is about the smallest detail and the greatest consideration. Wherever your destination, whatever your circumstance, each of our branches offers tailored services to your individual needs. For a free, no obligation home-moving survey and quotation, fill in your details in the enquiry form above. One of our local Moving Consultants will visit you for an informal chat about your upcoming move. If you’d like more information, don’t hesitate to speak to us directly: please call us, free, on 0808 273 9718. We’d love to know more about you and your move. It’s easy – call your nearest office to arrange a free property survey. A brief visit allows us to assess factors such as the volume of goods we need to move, access to property, type of packing required. Can we provisionally book a moving date? Unfortunately we can’t take provisional bookings. A completion date has to be confirmed. Will you do all of my packing and unpacking? Yes, but only if you want us to. It depends entirely on your preferences. We can carry out a full pack or a breakables-only pack. Both are cost-effective, but if you choose to, you can pack by yourself. What if we need to store our furniture/other large items? We can arrange storage for any quantity or duration. We’re not just removal experts, we’re storage professionals too. We even have a brand new self-storage facility in Oxford, so whatever you want to store, we have the right space for you!